There’s horror, there’s gore, and then there’s something that lies beyond both… Such stories are about wallowing in the absolute worst filth imaginable, and then coming out the other side only to discover that some types of dirt can never be washed away. 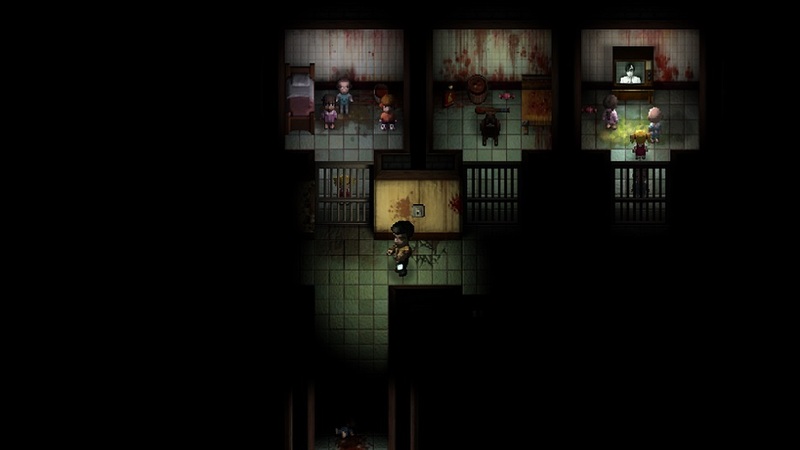 2Dark belongs to this third genre — it’s a game that opens with a brutal murder and a double kidnapping, and only gets bleaker from there. It’s possibly the most upsetting game available on the PS4, and that’s even after taking into account that the platform already boasts Rockstar’s nihilistic magnum opus Manhunt. Players take on the role of Smith, an ex-detective with tragedy in his past and an obsession with tracking down missing children. Lucky he lives in Gloomwood, which is apparently Europe’s child-kidnapping capital. Smith is a compelling lead — he’s grizzled and aged beyond his years by the heartache of a family torn away from him, he sees no particular value in life, and thanks to alcohol, he trudges on hoping that he’ll find out what happened to his children seven years ago. If it wasn’t for him, there wouldn’t be a single person looking out for the children of Gloomwood. Smith’s investigation in 2Dark takes him through six levels, each of offering the same two objectives: save as many children as possible and find evidence to keep the investigation going. When the adventure started in an abandoned amusement park run by a child-snatching clown, I assumed things wouldn’t get much worse. That was extremely naive on my part. Each of the six stages are populated by the most disturbing maniacs the developers could devise, each one but a single point on an interconnected web of evil constructed to traffic in children. Or sometimes, parts of them. It’s rare for a game to be as viscerally disturbing as 2Dark is. The retro-European art style is cartoony and acts as a secret weapon, cutting through the audience’s defenses by offering them big-eyed, large headed figures designed to elicit sympathy and then putting them through the most torturous degradation possible. The play can be punishingly difficult. Smith carries a light source in one hand, and a useable item in the other, but no matter how many weapons he gets ahold of, he’s not particularly adept at combat. No, the smart move is to stick to the shadows, wait for the right moment, and then stab his victims in the back. 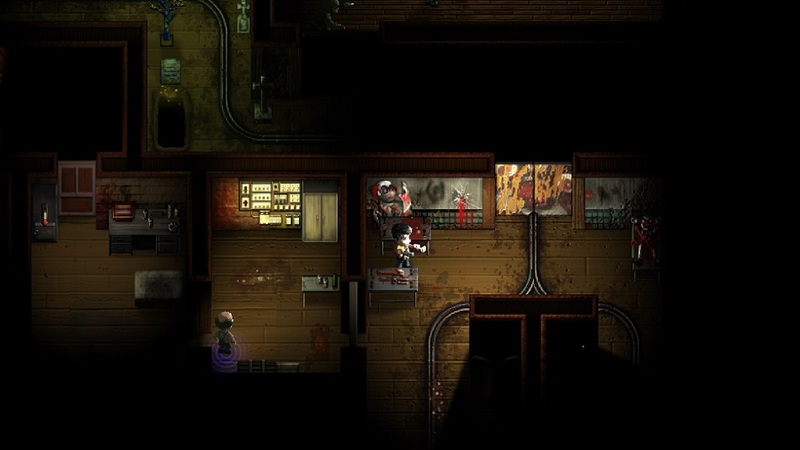 The player is helped by a surprisingly robust stealth and detection system — there are numerous ways to trick and distract enemy AI, allowing players to save their ammo for the bosses, who are mostly hard-charging bullet sponges. The game expects players to fail frequently, and Smith will remind the player to save if they’ve gone too long without doing so. Thanks to an easy quicksave option, there’s no reason not to experiment with a number of different solutions to any problem until one finally works. Other than a few puzzles that aren’t quite intuitive enough, 2Dark‘s only real problem is its inventory system, which is something of a bear to work with, and probably the biggest single obstacle to playability. Every level has more than twenty items to pick up, and some of the more cluttered stages are pushing 40 individual pieces. There’s a ten-item quick-use bar on the side of the screen and context menus on the shoulder buttons, but it’s still far too easy to get overwhelmed since play doesn’t pause or slow during inventory management. This lack of concession ramps the difficulty up to unfair levels during boss fights because standing still to reload isn’t an option when being chased by a chainsaw-wielding maniac. There are workarounds — carefully organizing Smith’s inventory can streamline combat, but while most of the game’s retro flourishes work beautifully, the clunky inventory system feels like something that should have been left in the past. Disclosures: This game is developed by Gloomywood and published by Bigben Interactive. It is currently available on PS4, XBbox One and PC. This copy of the game was obtained via publisher and reviewed on the PS4. Approximately 8 hours of play were devoted to the single-player mode, and the game was completed. There are no multiplayer modes. Parents: According to the ESRB, this game is rated M and contains blood and gore, sexual themes, intense violence, and strong language. This is a game about chasing down and killing child murderers. There’s every kind of perversion depicted that one could imagine, and none of it is shied away from in the least. Under no circumstances should any young person play this game. Deaf & Hard of Hearing Gamers: There are visual cues matching up to all of the game’s audio cues, including onscreen footstep markers and subtitles for all conversation. You should be fine.